Why Do We Need the Best DVD Copy Software? Last time, we have recommended top free DVD ripper software and best video file converter. Freeware is always the first choice for many people, but there also occurs shortcomings, especially for DVD ripping programs, for example, can’t rip some protected DVDs with the latest technology, the output video’s soundtracks may be out of sync with the pictures, can’t select the main title correctly, etc. So because of the technical difficulties to legally remove DVD copy protection, we have to turn to more powerful, easier-to-use and friendly DVD copy software. Here we get to the point: WonderFox DVD Video Converter and Wondershare Video Converter Ultimate are two of the best DVD copy software in the market. We’d like to make a detailed comparison between them to help you choose a proper DVD ripper in 2014. The Best DVD Ripper should hold the following functions. 1. DVD Ripping Capability: It’s one of the most important features. The best DVD copy software should enable us to rip either the classic or the latest DVD disc with perfect ease. 2. Output Video Audio Quality: It’s pretty cool to enjoy HD videos, DVD movies, TV shows on the devices on the go! Thus, excellent output video audio quality is required. 3. Conversion Speed: We always need faster speed and are unwilling to tie our computer to the conversion process. 4. Cost: Everybody wants to gain more with less money. Note: Both are latest versions: WonderFox DVD Video Converter v5.1 and Wondershare Video Converter Ultimate v6.7.1. Open WonderFox DVD Video Converter and click “Load DVD”, it offers two options to choose: Main Movie & All Movies, which lets users flexibly choose what they want or not. But if you want to convert the same DVD The Amazing Spider Man with Wondershare Video Converter Ultimate, you have to download a plug-in for it. Otherwise, a pop-up window continues to occur. WonderFox DVD Video Converter creates a better user experience. It can perfectly copy any protected DVDs including DVDs with DVD CSS, region code, RCE, Sony ArccOS, UOPs, Disney X-project DRM and the latest technology. Round 2: Conversion Speed—WonderFox Wins! Converting the same DVD movie - The Amazing Spider Man with duration of 02:16:09, WonderFox DVD Video Converter will take about 40:05:25 while Wondershare Video Converter Ultimate will take about 01:24:21. WonderFox DVD Video Converter supports Intel® Core TM, NVIDIA® CUDATM and AMD® to generate 6X faster video conversion speed with ZERO quality loss and with full use of the CPU cores! Round 3: Cost or Price—WonderFox Wins! Everybody wants to gain more with less money. WonderFox DVD Video Converter offers nearly all the key features that Wondershare Video Converter Ultimate has, but you can just pay much less money. Wondershare Video Converter Ultimate costs $39.95 for I year while WonderFox DVD Video Converter only costs $19.95 for 1 year and $29.95 for lifetime upgrades & support! 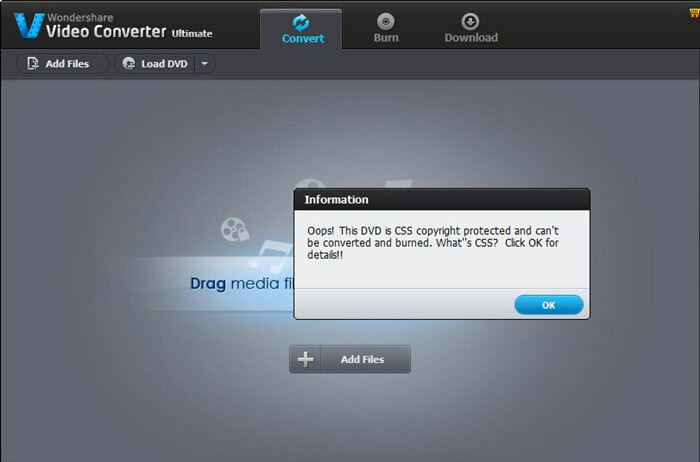 Download the DVD Video Converter to have a perfect free try. Conclusion: What is the best DVD Ripper? According to the WonderFox DVD Video Converter review and Wondershare Video Converter review, WonderFox DVD Video Converter is much faster and better. WonderFox soft is celebrating Christmas and New Year; everyone can get a crazy discount before Jan.10, 2014. How to Rip the Recent Hot DVDs? The Wolverine is the sixth installment in the X-Men movie series and the second film heading Wolverine after X-Men Origins: Wolverine. Hugh Jackman reprises his role from previous film as the title character and this time, Logan travels to Japan. DVD Iron Man 3 and DVD Man of Steel have been released. No matter which superhero movie you like you may need to know how to copy the latest released DVD to computer or any portable devices. CSS stands for Content Scramble System. It’s a digital rights management (DRM) and encryption system employed on almost all commercially produced DVD-Video discs to prevent DVD data from being copied. CSS utilizes a proprietary 40-bit stream cipher algorithm. In addition to preventing unauthorized copying, CSS helps to prevent unauthorized distribution of DVDs prior to their scheduled release date. DVD releases are often timed for different dates in different regions, and sometimes DVD content varies from region to region. CSS contains region information designed to prevent DVD players from other regions from playing DVDs with the wrong region code. This helps movie distributors prevent buyers from breaking scheduled distribution dates, as well as preventing illegal importing and distribution of region-protected DVDs.